Thing I didn't notice about this year's AirBNB from the listing: It has no actual desk, which is on me, but it does make both working for the day job and writing for here a little tough. Fortunately, there are two coffee tables that can be stacked one on top of the other, but I think I may actually wind up using my laptop on my lap a lot. The screwy thing is that there's an office chair here. Today was Guillermo del Toro day, but I pretty much bailed on that - as much as his press conference and the Master Class he was giving after the screening of Creature Designers: The Frankenstein Complex (in which he's interviewed) likely would have been great, there was this cascading list of other things that wouldn't work with it. Maybe next time he's at a festival I'm attending (which, hey, could happen). 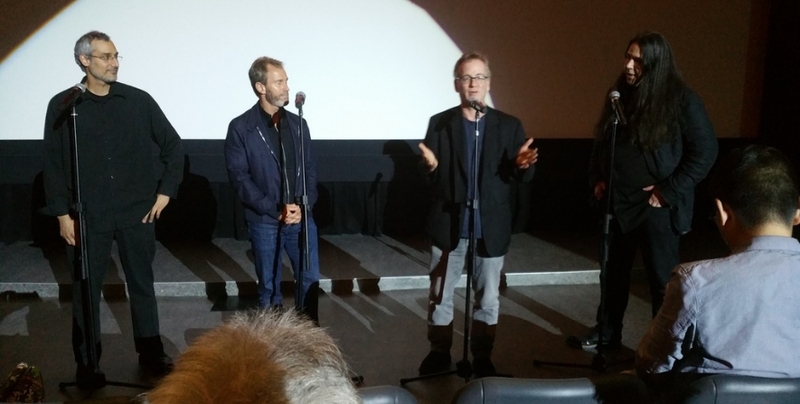 Left to right, there's photographer Karim Hussain, producer Andrew Lazar, co-writer/director Steven Shainberg, and festival programmer and emcee Mitch Davis, who runs a great Q&A (which is worth mentioning, because I was trapped in a lousy one a week or so ago; it's a skill). It was a fun one - from the start, I kind of suspect that Shainberg's festival experience generally hadn't included being introduced by someone quite so enthusiastic as Mitch, but he rolled with it well. Afterward, he said that the genesis of the movie came after watching Paranormal Activity, with it initially envisioned as an alien-invasion take on that. The found-footage method fell by the wayside, but I think a fair amount of that way of thinking about the movie found its way into Brian Nelson's script - it sticks pretty close to Noomi Rapace's Renee, basically following her, even if it doesn't get tied down to a specific POV. This also allowed Karim Hussain to do a lot of neat stuff - he apparently really likes gels and other ways of pushing color on the screen, and he talked about how there's a lot about this movie that becomes much clearer when you watch it in fast-forward, as the color pallette changes, Rapace moves to the center of the screen, and so on. A lot of that was apparently designed by Shainberg, who is one of the most prepared directors he'd ever worked with, showing up on the first day of shooting with huge binders for everyone on the crew. I'm hoping that Shainberg, Rapace, and a pretty good supporting cast get this an actual release; it's too good not to have on, but that doesn't always matter. Today's plan (already in progress): Parasyte Part 1, The Outer Limits of Animation, Terra Formars, The Master Cleanse, and Bed of the Dead if I get into a sold-out show. There's something kind of strange about an ongoing mystery series about a depressed detective who investigates the most horrifying cases without being able to do much to help. Mysteries, after all, are often meant to be reassuring in some way, that order can be restored from chaos. Religion has much of the same appeal, so there's some interesting work to be done in the latest "Department Q" story, A Conspiracy of Faith, but the whole is not quite the sum of the parts here as the filmmakers poke at that idea but don't quite elevate the film above the potboiler level. As this film opens, Assad (Fares Fares) and Rose (Johanne Louise Schmidt) are working Copenhagen's cold-case desk without lead detective Carl Mørck (Nikolaj Lie Kaas), who is on leave following another breakdown of the sort that got him assigned to Department Q in the first place. Assad brings him back in when a message in a bottle is recovered and appears to point to a pair of children who were removed from school in Ballerup eight years ago and subsequently dropped off the map. It's fortuitous that that this message has surfaced now; in the town of Skals, Elias Steensgaard (Jakob Ulrik Lohmann) and his wife Rakel (Amanda Collin) are being visited by Johannes (Pål Sverre Hagen), a preacher in their obscure religion, and while he seems nice, their daughter Magdalena (Olivia Terpet Gammelgaard) is instinctively nervous around him, even before he offers her and her brother Samuel (Jasper Friis Møller) a ride home. Jussi Adler-Olsen's novels are meant to be thrillers more than mysteries, at least based upon the two adaptations I've seen, so it's no surprise that Johannes is up to no good, but he's never quite so interesting a villain as someone with his twisted MO of infiltrating and targeting religious communities should be, and that's the film's greatest weakness - where the previous film had an intriguingly complex backstory, Johannes is just kind of a creep whose present is never fleshed out enough to be interesting and whose past is a series of flashbacks that aren't hefty enough to offer intriguing details until the end, and not much more than a mishmash of details that have shown up in his crimes. Pål Sverre Hagen does what he can in the role - his early scenes as the clearly untrustworthy "father" are obvious, but have a good menace, and he does do a good insane rant - but this guy is just never a worthy adversary. It's a nice little movie (well, not little, as the sucker's 130 minutes long) about a "live to work" type maybe learning a little restraint as not only does his body break down, but a second woman enters his life in the form of this doctor, giving him interests outside work, even as his longtime best friend who sends a lot of photo-retouch work his way is starting to build a life of her own. There are times when i think director Nawapol Thamrongrattanarit could, perhaps, have compacted it, but I think the pacing does help - we get a sense of him only seeing this new friend once a month and briefly, along with the numbing grind he subjects himself to. It's kind of a tough bit of show-don't-tell that may not work for everybody, but there's a sweetness to it, allowing for a lecture on work-life balance that seems to come from a friendly place rather than above. By dint of being far from prolific but doing something fairly different each time out, Steven Shainberg is slowly creating an intriguingly eccentric filmography, though one that has a clear personality behind it. Rupture, his first film in ten years, is every bit as peculiar and discombobulating as Secretary, but it's also an impressively intense sci-fi thriller. As much as things seem to be fairly normal to start - we're quickly introduced to single mother Renee Morgan (Noomi Rapace) as she tries to get her son Evan (Percy Hynes White) loaded in the car for a weekend at his father's - there are early signs that things aren't right: Some of the shots of these scenes are obvious surveillance video, and not only are there people sitting in a car just down the street, but they attach some sort of device to her car. Then, once she's alone, they force her off the road and kidnap her, driving days to a facility to test the limits of her fear, apparently believing that it will produce more than screaming. She is, however, more resourceful than they expect. Remove all the science-fictional trappings and just make the villains plain nuts, and this would still be a damn good kidnap thriller. What Shainberg sacrifices in highlighting the peculiar right away he gains in having the audience watch everything intently from the start, and he doesn't give the audience a lot of down time to introduce people and establish personalities through words, although both the ruthless, practiced efficiency of the kidnappers and Renee's dogged determination say a lot. He's aggressive in having the audience discover what's going on alongside Renee, using both the lack of information and the fragmented, bizarre pieces she does find to help share her sense of panic. A tense score and a great sound mix - doors locking and unlocking are a triple-tap instead of just a single, familiar bang - only make the atmosphere more suffocating.